If you’re searching for “radiant barrier“, “radiant barrier installation“, or “radiant barrier installation near me“, in Phoenix, Scottsdale, Mesa, Tempe or anywhere else in the valley, Barrier Insulation Inc. can help! We are radiant barrier insulation specialists with the best radiant barriers for your attic. The radiant barrier foil and radiant barrier paints we carry and install are the best on the market. We strive to achieve perfect installation help save you money on electricity! We offer all types of radiant barrier attic insulation to fit any application. Whether your building a new home or making an older home more energy efficient we have a radiant barrier solution for you. We carry the highest performance radiant barrier foil and radiant barrier paint from leading manufacturers. Read more below or call us to discuss your best options to help save energy in your home with radiant barrier insulation. HeatBloc is an excellent and aluminum colored affordable barrier that blocks 97% of the suns radiant heat. It is especially ideal for existing homes as it can be installed in enclosed areas at low cost. BASF Radiance is a paint simply brushed on the underside of roof decks, maximizing the comforting attributes of radiant energy. Easily applied with a spray, roller or brush, you can achieve total coverage in just a single coat. Known as Enerflex Radiant Barrier, it is available in many types and installs over your current installation. It reduces heat transfer very effectively and will more than pay for itself in money saved from energy bills. This type of insulation is installed in a house attic or attached to the roof rafters. It will block 97% of the radiant heat from the sun from entering the home or building. This keeps the attic cooler space cooler during the summer which reduces the amount of energy the air conditioner must use to cool down the house. 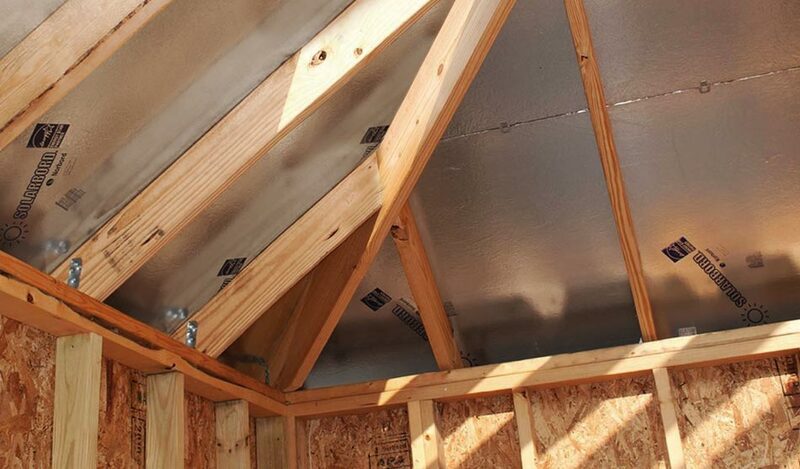 Radiant barrier insulation differs from traditional insulation in that it is designed to reflect heat instead of slowing the transfer through roofing material, attics, and into homes. Radiant barrier installation has the purpose of using highly reflective surfaces to reflect the heat before it can enter the attic. The installation of radiant barriers depends upon which type of radiant barrier you choose. Both HeatBloc® and Radiance® are applied much like paint. Either they are sprayed onto the bottom surface of your roof, inside the attic or they are brushed and rolled onto the surface. Radiant foil is applied much like rolled batt insulation by laying it down on the attic floor or hanging it from the rafters. Foil requires a empty space for the product to work its best. Once you have decided which radiant barrier insulation type is best for your Barrier Insulation will professionally install your radiant barrier. Radiant barrier installation in Phoenix will help lower the heat transfer through your roof, and lower your energy costs. Learn more about the cost to install radiant barrier here. Radiant barrier insulation has the same benefits as other traditional types of insulation, to keep our homes cool during the summer and warm during the winter. The major benefit to radiant barriers is homeowner’s ability to pair it with other traditional types of insulation. A radiant barrier help keep the attic cooler before heat even gets to your blown in insulation on your attic floor. This means that your traditional insulation doesn’t have to work as hard to keep the interior of your home comfortable.